Today we are being afflicted with a new disease the name of which some readers may not have heard yet, but of which they will hear a great deal in the years to come – namely technological unemployment. This means unemployment due to our discovery of means of economising the use of labour outrunning the pace at which we can find new uses for labour. Indeed, with so much innovation and change taking place around us – self-driving cars, 3D printers, smart homes, financial market ‘algos’, big data, artificial intelligence, internet of things, robotics – it is hard not to blame new technology for the high rates of unemployment affecting European and other advanced Western societies. It is hard not to… but you would also be amiss to do so. The same way that you may have been unaware that when reading the first paragraph of this piece you fell prey to a well-intentioned hoax. This paragraph, so eloquently predicting that a ‘new disease’ will afflict societies due to the gains in productivity outpacing or replacing the need for human labour, was written 85 years ago, in 1931, by one of the most celebrated economists of all times – John Maynard Keynes. He foresaw the generation of ‘technological unemployment’ as part of his manuscript ‘Economic possibilities for our grandchildren’. Since then, Keynes’, and most of other people’s, grandchildren, enjoyed a long period of sustained growth in employment and prosperity. One day in the 1760s James Hargreaves, a hand-loom weaver from the village of Oswaldtwistle, was struck by the way an overturned wheel kept on spinning. What would happen, the weaver wondered, if several spindles were to be placed upright, side by side? Might it not be possible to spin several threads at once? Working with a knife, Hargreaves shaped a primitive engine, a ‘jimmy’ – and the initial reaction from some was disgust. Angry neighbours raided Hargreaves's barn, on the grounds that the machines would ‘ruin the country’. If one jenny could do the work of eight spinners, reasoned the neighbours, that would put seven out of work. In fact, the spectacular new spinning capacity provided the basis for a cotton boom. In the 1770s, as earnings rose, spinners and weavers took to parading the streets on paydays with £5 notes in their hatbands. Their wives drank tea out of the finest china’. Source: R T Lacey (2007), Great tales from English history. There is little doubt that a new digital era has dawned upon us for some time now. Digital technologies are not only changing the way we learn and work but are also modifying social habits and the way we live our lives. And despite fears that digitalisation and robotisation will be a substitute for labour inputs, technological innovation has been historically associated with a positive net employment premium (Vivarelli, 2015). In most cases any initial labour-saving effects tend to be substituted by compensatory price or income effects associated with greater product innovation – such as lower prices of high-tech consumer goods and new product markets that steer higher aggregate demand. James Bessen’s (2015) fascinating journey back to the 19th century cotton mills illustrates, along with numerous other examples from economic history, that technological progress entails short-term disruptive effects that are nevertheless offset in the long-term by rising incomes, higher consumer demand and the creation of more productive and rewarding jobs . Such is the case also with regard to more recent technological advances, such as the introduction of automated teller machines (ATMs) in the 1970s in the US banking industry. Bessen (2015, p.108) has showed that by the mid-1990s there was no sign of such machines replacing human tellers, the reason being that the overall demand for more customer-oriented financial transactions rose during this period, operating costs fell and tellers could afford to devote their working time to other, more specialised, tasks. 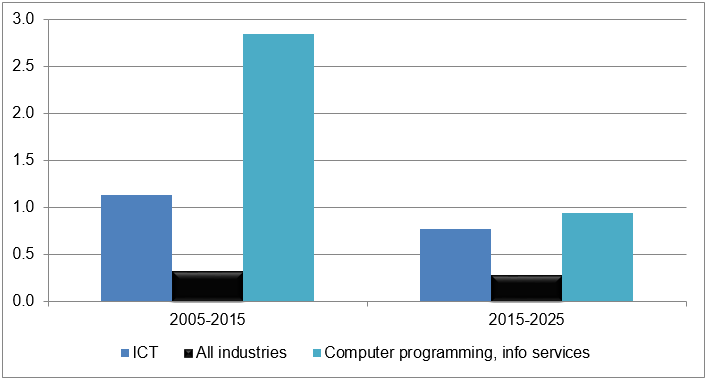 The spread of information and communications technologies (ICT), and especially of computing services, has proved to be a major jobs driver in European economies in recent years, although not at levels that would alleviate by itself job destruction due to automation (Berger and Frey, 2016). Yet, the ICT sector did enjoy an almost three times higher annual employment growth rate than the rest of the economy during the previous decade and was persistently strong during the global economic downturn. Indeed, about one million jobs were created in occupations tightly knit to ICT services, such as ICT professionals and ICT technicians and associate professionals, while, according to Cedefop’s skills forecasts , a further half a million jobs are also anticipated to be created in the next decade in Europe (Figure 1). Source: Cedefop European skills forecasts. Of course, the ICT sector accounts for a small share (3-4%) of total EU employment but digitalisation permeates most economic activities and occupations. Cedefop’s recent European skills and jobs (ESJ) survey  has revealed a remarkable degree of innovation going on across the board. Across the 28 EU Member States, 43% of EU workers have seen the technologies they use (e.g. machines, ICT systems etc.) change in the past five years or since the time they started their current employment, while 47% experienced changes in their working methods or practices . More than half of employees in Finland, Malta, Ireland, Slovenia, Sweden and UK felt the impact of changing technologies used for their work. New technologies are evidently more prevalent in the rapidly changing ICT sector, where 57% of all jobs have experienced change, but close to half of workers were also affected in several other high-innovation economic activities, industrial or not, including gas, electricity and mining (51%), financial, insurance and real estate services (51%), professional, scientific and technical services (51%) and manufacturing/engineering (49%) (Figure 2). Unsurprisingly, technological change is more likely to affect individuals employed in high-skilled occupations, most notably technicians and associate professionals (54%), managers (50%) and professionals (50%). 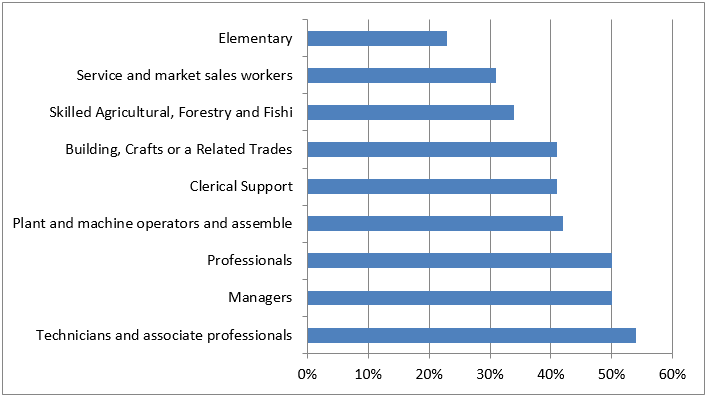 In particular, ICT technicians (67%) and ICT professionals (60%), science and engineering technicians (57%) and professionals (51%) as well as production and specialist services managers (55%), health professionals (55%) and electronic and electrical trades workers (55%) are very prone to having experienced changing technologies in their workplaces (Annex A1). NB: Share of EU adult employees who experienced changes to the technologies (machinery, ICT systems) they used in the past five years/since they started their main job. With such prevalent technological change taking place across and within EU workplaces, concerns about the disruptive effects of technological progress and digitalisation and implications for widening inequality remain strong. These are supported by the fact that digitalisation is believed to have fostered the polarisation of jobs in the labour market (Autor et al., 2003, 2006, 2015), namely the fact that many advanced economies have experienced a ‘hollowing out’ of jobs in the middle-skill spectrum (e.g. crafts and related trades, plant and machine operators). It is said that the greater automation allowed for by new technologies and advanced robotics has facilitated the substitution of jobs that were reliant on the execution of codifiable (usually routine/non-cognitive) tasks by machines. By contrast, past decades have seen greater employment growth for high-skilled occupations, which are intrinsically dependent on job tasks that require high-level interpersonal and cognitive skills. However, some increase has also been evident among low-skilled, non-routine jobs, in activities which require close human interaction and tasks that are not (yet) easily substitutable by machines (e.g. personal services, social care). By focusing on evidence of shifts in employment trends across different types of occupational groups, Frey and Osborne (2013) have thus argued that in light of the ‘second machine age’ close to a half of all jobs in the US could be at risk of being substituted by computers or algorithms in the next decade or two. Nevertheless, these claims have been recently dismissed on the grounds that they potentially exaggerate the extent to which occupations as a whole can be automated. In contrast, it is now well-reported that there exists a marked degree of variation in task complexity within broad occupational groups (e.g. Autor and Handel, 2013; Cedefop, 2015). For this reason, when estimating the risk of automation it is necessary to take into account the fact that workers who may be classified within the same occupational group may perform a different portfolio of tasks (routine vs non-routine, cognitive, manual, communication-based etc.) due to the fact that their employers may design their work or workplaces differently (Pouliakas and Russo, 2015). By adopting such an approach, a recent study by Arntz et al. (2016) calculated that the share of OECD jobs potentially at risk of automation is quite smaller than originally thought. The study found that just 9% of jobs in the countries that participated in the OECD’s survey of adult skills (PIAAC) are at a high risk of being automated on average (namely that at least 70% of the tasks in these jobs are automatable). The risk ranges from a high of 12% of jobs in Austria, Germany and Spain to around 6% or less in Finland and Estonia, reflecting differences between the countries in past ICT investments and structural characteristics of their economies. A larger share of jobs have also been found to be at a low risk of complete automation, whereby between 50-70% of their tasks may be automated. Although not entirely at risk of potential job destruction, these jobs have a high probability of seeing their tasks being markedly transformed. With between a quarter and two-fifths of jobs at high or medium risk of automation in OECD countries, it is expected that dynamically evolving technologies will render several of workers’ skills obsolete whilst placing a high premium on others. Indeed, Cedefop’s ESJ survey (Cedefop, 2015) revealed that about a quarter (26%) of adult employees in the EU labour market think that it is moderately likely, and one in five (21%) very likely, that several of their skills will become outdated in the next five years . Close to three in ten (29%) respondents working in the ICT services sector acknowledged that it is very likely to see their skills become outdated in the foreseeable future, while the jobs of employees in financial, insurance and real estate services (24%) and in professional, scientific or technical services (23%) are also at high risk of skills obsolescence. 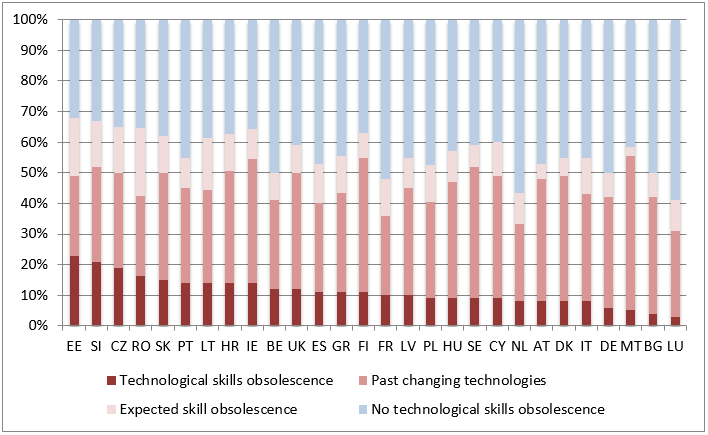 Combining the information collected as part of Cedefop’s ESJ survey regarding the incidence of past technological change in workplaces, together with the anticipated likelihood of skills becoming outdated, allows for further investigation of the susceptibility of EU jobs to the risk of ‘technological skills obsolescence’, namely the extent to which the skills profiles of jobs are relatively stable or vulnerable to change . About 10% of the jobs of EU employees are found to be at a high risk of technological skill obsolescence. These workers are not only employed in jobs in which they experienced changing technologies in the previous five-year period, but also believe that it is very likely that several of their skills will become outdated in the next five years. A further 11% of EU employees believe that there is a high likelihood of their skills becoming outdated in the medium-term future, although they did not experience recent changes to their workplace technologies. Some 33% saw the technologies used in their workplace change in previous years, but do not anticipate any future change in the skills required. Close to a half (46%) of the workforce has not experienced nor expects any significant modification to their overall skills set. NB: Ranking of countries based on combinations of the share of EU adult employees who either experienced changes to the technologies (machinery, ICT systems) they used in the past five years and/or expect that their skills have a high likelihood of becoming outdated in the next five years. Workers who experience both changing workplace technologies and expected skill obsolescence are classified as being at high risk of ‘technological skills obsolescence’. Figure 3 also shows that the threat of technological skills obsolescence seems to be highest in Estonia (23%), Slovenia (21%) and the Czech Republic (19%) as opposed to Germany (6%), the Netherlands (8%), Italy (8%), Austria (8%) and Denmark (8%), but also Malta (5%), Bulgaria (4%) and Luxembourg (3%). Overall, in Luxembourg (59%), Netherlands (56%), France (52%), Germany (50%) and Belgium (50%) more than half of all workers are in jobs relatively immutable to technological skills obsolescence, which is likely to reflect their higher past levels of investment in ICT capital equipment and new technologies. NB: Ranking of occupations based on an index of skills stability, derived as the share of EU adult employees who experienced changes to the technologies (machinery, ICT systems) they used in the past five years and expect that their skills have a high likelihood of becoming outdated in the next five years. Table 1 also depicts occupations that are mostly susceptible to technological skills obsolescence and those that exhibit a relatively stable skills profile that is least affected by technological change. It is evident that workers employed in ICT, health and engineering-related occupations, together with managers, are more likely to experience changing skills profiles in their jobs, whilst employees in the primary sector and in elementary or personal service occupations are relatively insulated from technological innovation. 5. What are the skills needs of the future? European economies have undergone rapid structural transformation in past decades and the thrust of such trends, such as a declining manufacturing share of employment, growth in demand for professional, scientific and technical services or the crowding out of middle-skill jobs, is expected to carry on into the future (Cedefop, 2016). By superimposing such anticipated employment trends into the future, it is possible to obtain an indication of the type of skills that are likely to grow in demand in the next decade. NB: The figure compares the average level of importance of a given variable on the vertical axis between two job clusters – those predicted to have positive employment growth versus those with negative employment outlook. Jobs (i.e. combinations of 2-digit occupations and economic sector) are broken down into two clusters based on the difference between current (2015) and anticipated (2025) employment. Projected employment trends per job are obtained by Cedefop’s skills forecasts. 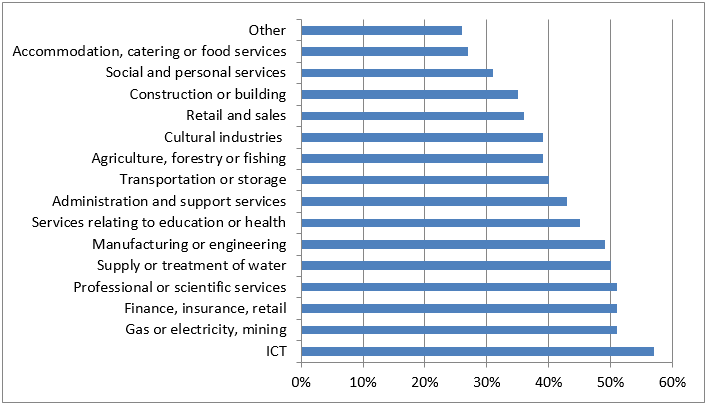 Information on the importance of skills, education requirements and tasks/technologies, as extracted from the ESJ survey, is superimposed at the job level. All variables have been normalised to a 0-1 scale, where a score of 1 indicates a higher/rising incidence of the variable and 0 a very low incidence. Source: Cedefop European skills and jobs survey; Cedefop European skills forecasts. To do so, data capturing anticipated employment projections in EU sectors and occupations, based on Cedefop’s skills forecasts, are linked to information capturing the relative importance of a bundle of 11 skills in each employee’s job, collected as part of the ESJ survey. Specifically, the jobs-based approach employed by Eurofound (2016), which relies on breaking employment down into details ‘job cells’ (comprised of the combination of specific two-digit occupations in a specific sector), has been adopted to create a matrix of 809 ‘jobs’ in the 28 EU Member States. Under the assumption that historical structural employment trends in EU industries and occupations will extend into the future, it is thus possible to obtain an ‘educated guess’ of the types of job tasks and skills that are likely to be in demand in the forthcoming decade. 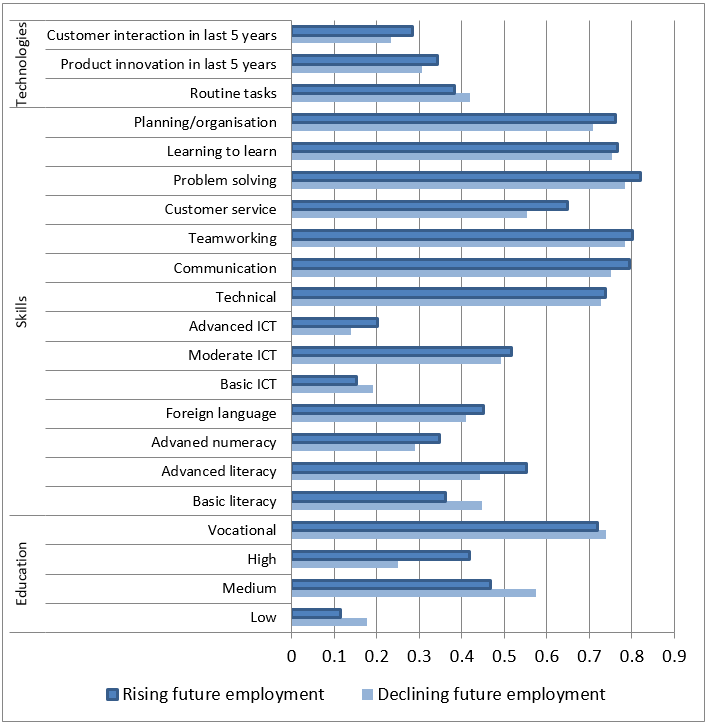 Figure 4 contrasts the skills profiles and task content/technologies of the jobs predicted to decline in employment between 2015-25 (e.g. skilled agricultural workers, crafts and related trades, numerical and material recording clerks etc.) with those expected to grow (e.g. business and administration professionals, ICT professionals, science and engineering professionals, customer service clerks, assemblers, cleaners and helpers etc.). The figure provides evidence that much of the anticipated employment growth in the next decade is associated with jobs that have entailed greater product innovation and customer-service orientation in recent years. It is also routine-biased, given that jobs declining in employment exhibit a greater reliance on routine tasks. If historical employment trends continue unabated into the future, it is also reasonable to expect that there will be a rising demand for higher-level skills in the EU economy. Specifically, the figure shows that jobs that may experience rising employment growth are dependent on workers with higher educational qualifications. Although a lot of jobs reliant on vocational studies are predicted to decline in the next decade, there is still a strong demand for vocational graduates within the cluster of jobs that have a positive employment outlook. Furthermore, it is evident that jobs with positive employment prospects are more likely to rely, on average, on advanced cognitive (literacy, numeracy, foreign-languages, problem-solving, learning) and non-cognitive (communication, planning, customer service) skills. Of course, superimposing the information on average skill needs at the level of ‘jobs’ and mapping future skill needs on the basis of the structural change in the employment pool of the EU economy fails to account for the within-job changes in skill demands. It is possible to examine if the future employment distribution of jobs is associated with jobs that already entail a higher or lower variance of skill needs, but it is impossible to predict whether this within-job variance will increase (following skill- or routine-biased technological change) or decrease (due to deskilling). The Cedefop ESJ survey nevertheless asked adult employees whether the variety of their job tasks, and the need to learn in their jobs, has increased or decreased since the time they began their current employment. The survey reveals that about 4% of the workforce claimed that the task variety in their jobs decreased since the start of their employment while for 17% of employees it remained the same. More than a quarter and close to a third of workers in some industries (e.g. 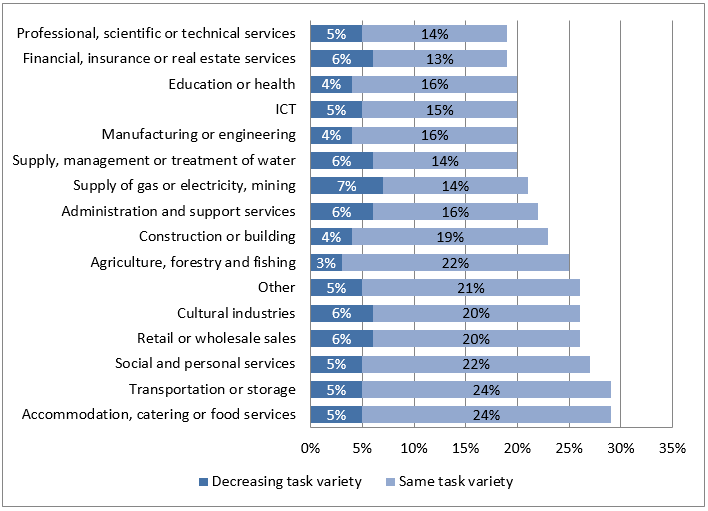 cultural, retail and wholesale trade, transport and storage, accommodation and food services) have not experienced any change in task complexity and rising skill needs in their jobs (Figure 5). The ESJ survey therefore highlights that the trend towards higher skill needs, which is undoubtedly implied by the expected structural transformation of the EU economy towards specific high-growth sectors and occupations, may not necessarily manifest universally within future jobs. NB: Based on the share of responses to the question: ‘Has the variety of your tasks increased, decreased or remained the same since you started your job with your current employer? Please use a scale of 0 to 10 where 0 means it has decreased a lot, 5 means it has stayed the same and 10 means it has increased a lot.’ Decreasing task variety is captured by the proportion of employees with a score lower than 5. Fears that technology will substitute labour are certainly not new and the “end of work” is certainly not ‘nigh’. Technological progress and ICT technologies have not only created new, typically high-skilled jobs (e.g. web applications designers and developers, market research data miners etc.) but are also expanding possibilities for individuals to undertake more interesting and productive tasks at work, leaving the more routine activities to those best-equipped to do them – robots. But one cannot completely dismiss the possibility that things may take a different turn this time around. In contrast to the past, typical innovation cycles seem to be much faster now than before and automation/robotisation is creeping into a number of high-skill occupations (e.g. paralegals, nurses, financial analysts) and jobs involving non-routine tasks, following rapid advances in machine learning and visual/spatial perception (Ford, 2015). Moreover, new technological industries that are being created tend to be less labour-intensive than in the past (contrast the experiences of new web applications companies such as Instagram with the thousands of employees who were once employed in the industry giant Kodak). While there are also serious concerns about the fact that the historical link between higher productivity and real wage growth has now been weakened and that the falling price of ICT technologies is feeding into a rising share of capital inputs in total income (Berger and Frey, 2016). Whether job creation or destruction will prevail as a result of new technologies will depend on various factors, notably whether R&D investments will continue to breed job-friendly product innovation as opposed to embodying them in capital goods (machinery and equipment) (Vivarelli, 2015). It is also critical that new innovation feeds into falling unit costs and prices and superior services, which will stimulate buoyant demand in product markets. This intrinsically depends on preserving a healthy degree of competition in markets, preventing oligopolistic/monopolistic practices. It will be shaped by the regulatory and institutional infrastructure as well as social barriers put in place by humans. For example, the wider proliferation of models of employee-shared capital ownership, or stronger collective bargaining institutions, could enable humans to enjoy more hours of leisure in the future, ultimately reducing inequality and technological unemployment associated with just a few people ‘owning the robots’ (Freeman, 2014). What is nevertheless clear is that the widespread transformation of the world of work will pose a great challenge to policy-makers, who will be summoned to manage the potential displacement and skills obsolescence of many (low-skilled) individuals. Ultimately, the extent to which technological progress translates into a jobless society will depend on human, rather than artificial, intelligence. Arntz, M., T. Gregory and U. Zierahn (2016), ‘The Risk of Automation for Jobs in OECD Countries: A Comparative Analysis,’ OECD Social, Employment and Migration Working Papers, No. 189, OECD Publishing, Paris. Autor, D. H. and M. J. Handel (2013). ‘Putting Tasks to the Test: Human Capital, Job Tasks, and Wages’ Journal of Labor Economics, 31(2): S59-S96. Autor, D. H., F. Levy, et al. (2003). ‘The Skill Content of Recent Technological Change: An Empirical Exploration’ The Quarterly Journal of Economics, 118(4): 1279-1333. Autor, D.H. (2015), ‘Why are there still so many jobs? The history and future of workplace automation,’ Journal of Economic Perspectives, 29(3), 3–30. Berger, T. and C. Frey (2016), ‘Structural Transformation in the OECD: Digitalisation, Deindustrialisation and the Future of Work,’ OECD Social, Employment and Migration Working Papers, No. 193, OECD Publishing, Paris. Bessen (2015), Learning by doing: The real connection between innovation, wages and wealth, Yale university press. Brynjolfsson, E. and McAfee, A. (2014). The Second Machine Age, Work, Progress, and Prosperity in a Time of Brilliant Technologies, W.W. Norton & CO.: New York. Cedefop (2015), Skills, qualifications and jobs in the EU: the making of a perfect match?, Cedefop reference series No. 3072. Eurofound (2016), What do European do at work? A task-based analysis: European jobs monitor 2016, Publications office of the European Union: Luxembourg. Ford, M. (2015). Rise of the Robots: Technology and the threat of a jobless future, Perseus Books Group, New York. Freeman, R.B (2015). Who owns the robots rules the world. IZA World of Labor 2015; No 5. Frey, C. B., & Osborne, M. A. (2013). The future of employment: how susceptible are jobs to computerisation? Pouliakas, K. and Russo, G. (2015). Heterogeneity of skill needs in relation to job tasks: evidence from the OECD PIAAC survey, IZA discussion paper series; No 9392. Vivarelli, M. (2015) “Innovation and employment”, IZA World of Labor 154. Discover more ESJ survey indicators and analysis at Skills Panorama website. Please cite as: Cedefop (2016), ‘Rise of the machines: Technological skills obsolescence in the EU’, #ESJsurvey Insights, No 8, Thessaloniki: Greece. The Cedefop ESJ survey is a new European survey, carried out in 2014 in all 28 EU Member States, which collected information on the match of the skills of about 49 000 EU workers (adults aged 24–65) with the skill needs of their jobs. In the construction of the index of technological skills obsolescence only those workers who responded that it is very likely to experience skills obsolescence (i.e. gave a score above 7) are used.